The two teams came into this match having already clinched their playoff berth and trying to improve their seeding. 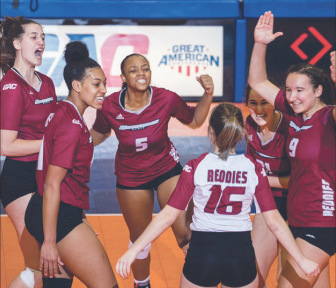 The last time Henderson State Reddies and Ouachita Baptist Tigers faced off, the match went five sets and ended with the Reddies coming out on top. This match was much of the same with neither team being able to get a comfortable lead. The rivals started, the set tied at two. Adrianna Hartmann got a huge block to put the Reddies up 3-2 ,the lead did not last long as neither team could stay ahead of the other early in the set, with the largest lead being one point. Hartmann scored three of the first seven points to give the Reddies a 7-6 lead. The Tigers tied the set again at eight before the Reddies went on a 6-1 run led by a thunderous Courtney Bolf kill and two ace serves by Gigi Garramone. Henderson led 16-12 and looked to have the first set in control. A kill from Courtney Bolf gave the Reddies a 17-12 lead. From there the lead proved to be insurmountable and the Reddies took the first set 25-18. In the second set the Reddies jumped out to a 2-0 start before the tigers responded. Ouachita took a 4-3 lead and they then used that momentum to go on an 8-1 run and shift the set in their favor. The Reddies responded by an 11-4 run but it would not be enough as the tigers would go on to win the second set 25-15 and tie the match at one win a piece. The third set was much like the first, with neither team being able to separate, the set was tied six, with two kills from Bolf. The tigers would separate and take a two-point lead at 8-6 but after a serve error from the Tigers and a block from Zuzana Ondruskova the set was once again tied. Ouachita would score three unanswered points which would lead to a Reddie timeout. The timeout would prove to be unhelpful however, as the Tigers would take the 16-9 lead. 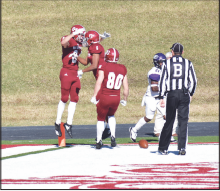 The Reddies would not go down without a fight and brought the score within four points at 20-16 but the Tigers kept them at bay and went on to win 25-18. Ouachita seemed to have all the momentum after winning back to back sets. The Reddies knew if they were to drop another set it would result in losing to their odious rivals. The Reddies came out aggressive taking the early 3-1 lead. Hartmann would get her sixth kill of the match and give them a 4-2 lead. After a kill and an ace from Bolf, the Reddies would lead 6-3. After kills from Hartmann and Ondruskova and an attack error on Ouachita, the Reddies possessed a 9-3 lead. It appeared that Henderson State was in control of the set at 11-4 but Ouachita would go on 7-0 run to tie the set. Henderson quickly took two points, but the Tigers would tie it again. Bolf led the Reddies on a 5-1 run and the Reddies would go on to win the set 25-19 and tie the match at two. The fifth set was tied early with neither team giving ground to their opponent. The Reddies led 8-6 when Kenzie Thomas dove to keep the ball in play and Tyasia McGruder followed up with a kill to push the lead to three. The Reddies went on to win the set and the match 15-9 and sweep their rival for the first time since 2010. They also notched their 23rd win, which is the most since 2001 in which Henderson won 28 games. Bolf finished the match with 18 kills, and 17 digs. Hartmann had 11 kills and eight blocks. Ondruskova had 11 kills and 13 digs to finish the match. The Reddies fell to the Harding University Bison in five sets. The Bison are undefeated at home but the Reddies put up a fight, this was the first match that Harding had to go five sets at home. Had Henderson won, they would have been tied with Harding atop the Great American Conference but after losing they are in third place. 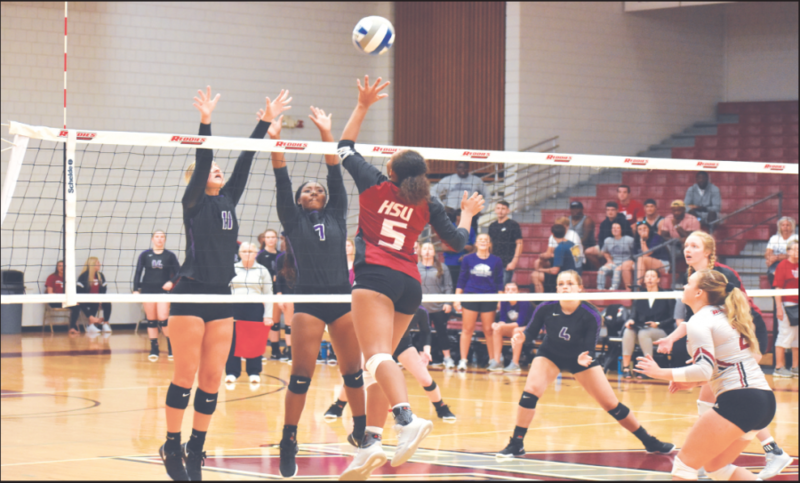 The Reddies came back home looking to rebound after their hard-fought loss to the Bison, as they took on the Lane College Dragons and defeated them in three straight sets. The Reddies have won more matches than any other team in the GAC. Courtney Bolf now ranks in 9th place in total numbers of kills all time at Henderson State.